~ Foraging ~Don't Kill Those Weeds! Purslane is a powerhouse of nutrition. Hippocrates used it as a medicine. Henry David Thoreau found it in a cornfield, boiled it, and called it a “satisfactory dinner.” Many Europeans today eat it as Thoreau did, or chop it up fresh and put it in their salads. It’s known as purslane–a plant that is a troublesome weed in many U.S. crops, especially vegetables. But recent research findings confirm that purslane is also a rich source of fatty acids, vitamin E, and other key nutrients–making it a prime candidate as a new vegetable crop. For example, if you currently take fish oil capsules, omega-3 oil capsules, flax oil, or anti-depressants, a switch to purslane could improve your health and save you lots of money, too. Herbalist James Duke says purslane contains up to 4000 ppm of the omega-3 fatty-acid alpha linolenic acid (ALA) Eating purslane is tastier, safer, and more effective than taking omega-3 supplements. To increase the effect, Duke suggests adding walnut oil to your purslane. Purslane counters depression. It is one of the five herbs — lettuce, amaranth greens, lamb’s quarters greens, and watercress are the other four — richest in antidepressant substances. Purslane is a superior source of calcium, magnesium, potassium, phenylalanine, and tryptophan, all of which are known to moderate the effects of depressive brain chemicals. It is native to India and Persia and has spread throughout the world as an edible plant and as a weed. Many cultures embrace purslane as a food. Purslane has fleshy succulent leaves and stems with yellow flowers. They look like baby jade plants. The stems lay flat on the ground as they radiate from a single taproot sometimes forming large mats of leaves. It is closely related to Rose Moss, grown as a “not so weedy” ornamental. Purslane is an annual reproducing from seeds and from stem pieces. Seeds of purslane have been known to stay viable for 40 years in the soil. If you are trying to control purslane the number one rule is don’t let it go to seed. About three weeks after you notice seedlings, the flowers and seeds will be produced. Also plants or plant pieces that are uprooted but not removed can root back into the soil. This lemony, crisp nutritional powerhouse is neither, it’s actually a succulent. Many describe it as similar to arugula or spinach. It’s less bitter than arugula and less tannic than spinach. It can be prepared in many of the same ways as either. Cabbage – Purslane has more vitamin C.
Beets – Purslane has more vitamin A.
Swiss Chard – Purslane has more iron, calcium. Frozen Blueberries – Purslane has more iron, calcium. The stems and flower buds are also edible. Trim the tough stems near roots using sharp knife. Cook under low temperature for shorter period in order to preserve majority of nutrients. Although antioxidant properties are significantly decreased on frying and boiling; minerals, carotenes and flavonoids may remain intact with steam cooking. Fresh, raw leaves can be used as a salad and as vegetable juice. So looking in my front yard filled with weeds I decided to research what they are. My son told me a main weed is wild pepper grass. He said its great to use as a spice like mustard . I tasted it and wow! yes strong taste like mustard and or horseradish. Here are its nutritional , medicinal values and a few ways to use. The leaves of wild pepper-grass are nutritious and generally detoxifying, they have been used to treat vitamin C deficiency and diabetes, and to expel intestinal worms. 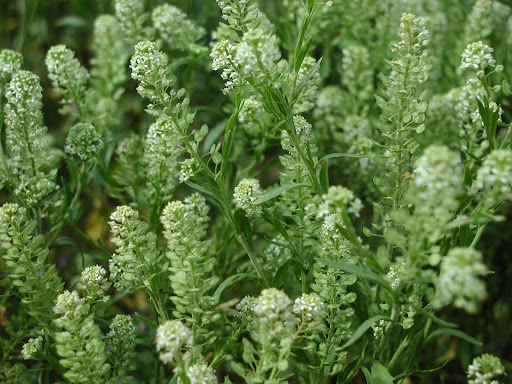 The herb is also diuretic and of benefit in easing rheumatic pain. North American Indians used the bruised fresh plant, or a tea made from the leaves to treat poison ivy rash and scurvy. A poultice of the leaves was applied to the chest in the treatment of croup. The seed is antiasthmatic, antitussive, cardiotonic and diuretic. It is used in the treatment of coughs and asthma with excessive phlegm, oedema, oliguria and liquid accumulation in the thoraco-abdominal cavity.A poultice of the bruised roots has been used to draw out blisters. The root is used to treat excess catarrh within the respiratory tract. Young leaves - raw or cooked. The leaves are a rich source of vitamin C and have a hot cress-like flavour. Chopped finely and added to salads, used as a garnish or cooked as greens. Unripe seedpods have a pleasantly pungent flavour and can be eaten raw or used as a condiment in soups and stews. The seed is a pepper substitute.